I finally got tired of scrolling through the site list and created a note to remind me. My goal is to not post questions to the wrong community. I find deciding between Super User vs. Stack Overflow and Super User vs. Server Fault to be particularly challenging. I always refer back to the phrasing. I think it would help with the quality and relevance of questions if both the / and /questions/ask for each site included the blurb shown on the sites list. Why doesn't the root (and 'ask') page of SE sites explain what the site is for? I mean we kinda do. and the others have some variation of the above depending on the site. You can also visit the Help Center (\help) and Tour (\tour)of each site if you forget. 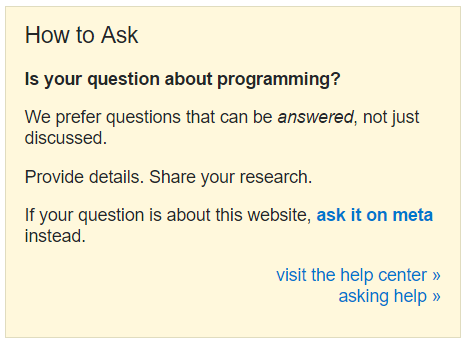 Where can I find rules on which Stack Exchange community site my question should be asked on?